A cup of coffee prepared just right. An early morning walk. A scrumptious meal. Tickling my toddler son and hearing his giggles. Getting caught up with a friend. Reading a good book. Catching a movie with my family. Yesterday, I was in heaven. I love football. I plopped myself down and took in all of the excitement of a new season. It was me, my dad, my fiancé and a high-definition, widescreen TV, seemingly made to watch football games. We talked through plays, commiserated over the loss, and nibbled on food. Little things provide life’s seasonings. 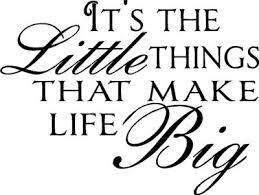 We often focus on the big things, but the little things are what make life so enjoyable. More often than not, the small stuff is what makes me smile. It helps to fill my memories years down the line – even more than the big stuff. I think it’s because the small stuff occurs every day. I find these happy moments in the luxurious spa bath, finishing up the items on my “to-do” list, the smell of the earth after the rain, the feel of sunshine across my face. The little things help to flesh out our relationships, build security and to keep us motivated for the big stuff. It can be as simple as a compliment from someone that comes out of the blue. I remember receiving a note from an editor once telling me I did a great job on an article, and he even pulled a line from my story and quoted it in the note. I never forgot that kind gesture. I remember my grandmother, now 101 years old, showing me how she baked her famed zucchini bread and peach cobbler. Now, every time I make either, I think of her. The small stuff can also help remind you who has always been in your corner, from day one. I remember going to a basketball game at Mount Saint Mary’s College in the late 80s. I was still in high school, but I was visiting my older sister in college. I felt so grown that weekend, hanging with my sissy. She introduced me to all of her college friends and I got to taste campus food. During the basketball game, a fight broke out among rival schools, and everyone was fighting – from the guys on the court to people in the stands. My sister grabbed me by the hand and started pulling me towards the door, leading the way and willing to fight to protect her baby sis in the event we didn’t make it out of there unharmed. That image never left me. I try to create things with my nieces and nephew that they will always remember. Life happens in a blink of an eye and this moment, while they are still young adults, is important. I make it a point to try and notice things about strangers and to try and say something pleasant to help them have a good day. I was at the grocery store yesterday, and I complimented a lady on her hairstyle. I did the same the other day to a store clerk at an accessory shop. It takes little effort on my part, but it may make a world of difference to someone else. I know it does for me. What little things make you happy? How are you helping to spread joy to other people? I totally agree, it is a pleasure to make someone’day, especially a stranger. Thank you for your inspiring words. They provide a very positive light to my day! Thanks for reading and sharing your encouragement and support! I love this article and agree 100% that it’s the little things in life that makes us who we are daily. Every woman wants a man to take her to a expensive restaurant with candles and a bottle of their best wine. But my ideal date is filling up a picnic basket, going up to the Liberty State Park, laying out a blanket, talking and enjoying the environment. Just make sure the bottle of wine is in the basket as well. Simple and sweet date. That sounds like an awesome date, Deirdre! Thanks for reading and commenting. I always like greeting people when getting on an elevator. It has always seemed odd to me how people will share the most crowded of space with you without making eye contact or even an acknowledgement of your presence. Once the silence was broken, I can’t recall it ever being a negative experience. People are generally the same in wanting to be treated with love and respect. Like your article so eloquently points out, it takes so little to make someone’s day or a lasting memory. Great job! I’ll bet that little gesture on the elevators made someone’s day, Aunt Ann. It takes so little effort on our part but yet can yield such huge benefits. Thanks for reading and commenting. I offer a smile which always breaks the silence.